Get your mind out of the gutter...not that kind of stoned. 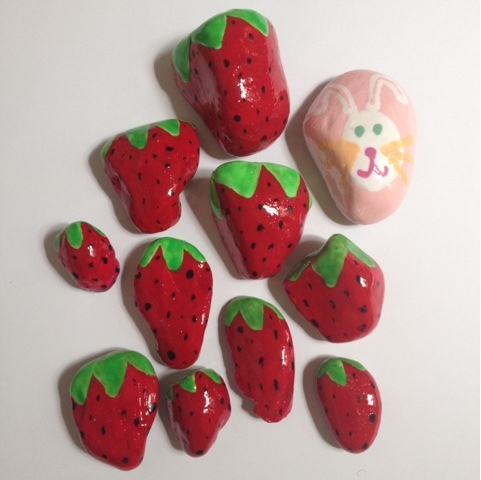 The way I have painted strawberry rocks for the garden and little memory rocks for Sadie's Spot, I've made a few bunny rocks, too. Because I always called my best baby girl, Sadie, my baby bunny. In fact, I often wondered if she thought it was her name as much as Sadie because I used it so frequently during the day. So I have little painted bunny stones in a few small corners in my garden. Just a little way for my heart to keep her with me because I am still missing her so much. Then, now, and always...my baby bunny! So sweet! And are you sure you are not at ZTA? I know I told you we use strawberries but since we don't have an official animal like most sororities different ones are used and my chapter used a bunny. Hugs! I know it has been rough lately.